Expect clarity, detail, speed and punch from the stand-mounting RS1, a compact, two-way reflex-ported system that incorporates a single 6â€ (150mm) C-CAM bass/mid-range driver and a 1â€ (25mm) Gold Dome C-CAM tweeter. With high efficiency (90dB) and power handling (80W), the RS-1 will release all the dynamic impact of music and movie sound with little cost to living space. I thought I should add an important note to all the reviewers that are pretty right about these speakers. They are great in many aspects except one... The seriously lack the depth of bass. Yes the bass is punchy and pronounced and they kick really well. But the depth is lacking to my ear very much. I play electronic music and most of if cannot be handled by these speakers. You don't hear any 50hz sounds, I am not even sure if one can hear 60Hz sounds. I have auditioned Boston Acoustics A26 speakers that are similar in size but the bass... Man, it is deeper than some column speakers can provide, a totally different league. So generaly you can easily produce a deep bass with that size of a cone. An RS1 just annoyingly lack bass depth. Another thing that when you crank the volume up you can clearly hear the cone running all over the place and trying to produce that bass. Yes they might be 80W in power but after half the volume the bass becomes so... not tasty, noisy. So my advice is choose other speakers if you desire full bodied sound. I have no choice but to add a subwoofer. I directly compared these to several hand picked bookshelf speakers in my own sound room. They were my price point favorites. Overall winner was the Snell .5, but these were close and were much less expensive. Mordaunt Shorts had better resolution, but not as warm. This is a no brainer. I found them more detailed than the B&W and more satisfying, but less bass. Add a solid sub and you have some magic here. Of the 10 spacers I reviewed, I kept the Snell .5 and the Klipsch RBs. I an a tube amp guy, so I use the Klipsch to rock out where i need high output. Otherwise the Snells are the top pick. looks and construccion are excellent too, highly recommended. I recently upgraded or to some maybe downgraded from the Monitor Audio Silver 6 Floorstanders to the RS 1's. My equipment is as follows: Arcam Alpha 9 integrated, Sony playstation 1 heavily modifed. Planet waves interconnects, Profigold silver plated speaker cables. Right out of the box, whilst a little hard and SLIIGHTLY harsh as the other reviewer mentioned. There are definately tremendous improvements compared to the (S) Silver range. I do understand that every speaker needs its own time to break in and Im very excited to hear the improvements over time, This one in particular is unique as upon immediately playing it shows incredible potential, there is depth, there is transparency, and the tweeter doesn't scrape those levels of harshness like the old silvers. It simple holds those top notes with such a grip that those high frequency's seem to flow out like silk. Obviously bass isn't prominent, but then again this isn't a floorstander. What you do get is an incredible rounded sound, I got rid of my silver 6's for just that, a speaker that simply integrates the high and mids well... this speaker goes far beyond expectation of what great bookshelves should sound like. Inspecting the craftmanship of the speaker i'm further floored by the quality of the real wood veneer, there are no visable joints, and the weight alone just adds to the confidence that this lttle brute has to produce amazing tunes. Partner this with a Rotel, Nad or Arcam amp and some weighted speaker stands and you won't go wrong at all. Bowers DM 602 S3, also a wonderful speaker but has a crappy vinyl sticker finish. Slight harshness in male voices with a low baritone. Got them in Feb 2006. Right out the box, they sound bright and harsh. But, give them time to run-in, they will sound much better. How much time? At least 300 hours. Mine took that long before the mid-range sounded ultra-smooth. Silbilance become less pronounced and higher freq sounded sweet. The sound is fast and they don't have any problems tracking fast rythms as long as your amp is up to the job. They are a bit weak in the bass department, but that's because there's only so much air they can move in that cabinet. Putting them on stands worked wonders. More control and less woolly in the bass. I set them up about 25cm from the rear walls. Too much out from the walls, and the bass loses punch. For best results, I bi-wired them. They sound better with a cleaner top-end than if I used the al-cheapo metal stamped plates that shorted the binding posts. Throw these away and use bi-wiring instead. In terms of looks, they look real nice with their grilles off. Wife didn't like it though. So, I put them back on. Quick and articulate. You'll hear things you've been missing. Some may say low level frequency reproduction but I say they compete with some floorstanders. I'd been looking to replace my Bic America dv62si bookshelfs (EFE modification) with a pricier and better two way. I auditioned the RS1 in New Jersey in January after reading a very good review in England's What HiFi magazine and another excellent review of the previous model S1 in Hifi Choice magazine. I wasn't prepared for what I was about to hear. The sound from these speakers jump out at you. They're stunningly fast and accurate and the bass is more than adequate considering their small size. What's more, the bass is punchy and tangible, something you rarely hear in such a small design. Tweeter extension is top notch yielding an open and airy sound, so if it's resolution you crave, these speakers may be your ticket. Prior to buying these little gems, I auditioned them against PSB B25's and Infinity Beta 20's. They sound muddy compared to the RS1's. The RS1's sound better than anything out there for their size and price. Sound, bass for size, cosmetics improved over last years model. 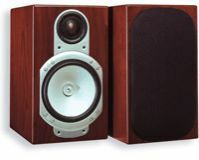 I love them, I sold a $1,000pair of Wharfedale towers after auditioning these. Better in every area. Better than last years S1's and those are excellent. Much improved cosmetics looks like a more expensive speaker , more like the golds.